Item: YJS Soft TPU Case for Apple Watch Series 2 42mm in Black Compatibility: Custom designed for your precious Apple Watch Series 2 42mm, the YJS 42mm Apple Watch Case features a combination of functionality and fashion. Color: Black Package: 1* YJS Apple Watch Series 2 Case Watch case ONLY, the watch is not included. Applied electroplated coating technique, the case surface looks shiny (except for the clear case), making your watch more elegant and luxury. This case fits the Apple Watch Series 2 very well, with easy access to the screen, power button, the digital crown and the speaker. 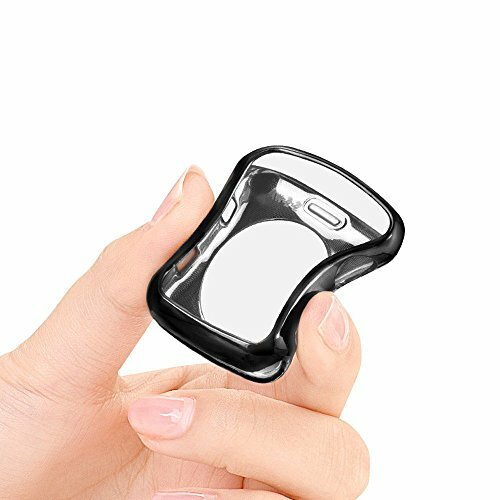 This case is soft and flexible with high quality material used; It will provide your watch extra protection against being scratched. Adds minimal bulky to your watch with sleek and lightweight design; 12 months no-hassle warranty, contact us if any problems when shopping with us. If you have any questions about this product by YJS, contact us by completing and submitting the form below. If you are looking for a specif part number, please include it with your message.